The recent release of the final tax tables for 2008 by the Canada Revenue Agency allows us, for the first time, to know what the tax cuts announced in the 2007 and 2008 provincial budgets actually cost us and who benefited. There were two types of cuts: changes to the marginal tax rates for each of the three tax brackets and the elimination of the 9 per cent surtax on net taxable incomes over $60,000. The rate changes were phased in over two years, from July 2007 to June 2009, while the elimination of the surtax took effect immediately. In 2007, the rate change meant a loss to provincial revenues of $80 million, while the elimination of the surtax cost us $48 million. In 2008, the combined effects of the rate changes announced in the two budgets meant a loss of $215 million, while the eliminated surtax would have amounted to $56 million. The full effect of the 2008 changes came only in 2009, when the province ran a $294 million deficit. By the end of 2008, the cumulative cost to the public treasury of the cuts had already totaled $398,924,172. These tax cuts affected people very differently depending on how much they earned. Just under half of all the people filing a tax return earned less than $20,000 in 2008. People who earned that little received a cumulative tax cut of $249, while the top income earners, those with annual incomes in excess of a $250,000, averaged $24,490. Averaging $411,880 or 20 times the median income, they received 100 times the tax break. The 2007 budget spun this massive giveaway as “leaving money in the pockets of those who earned it.” These were boom years for the provincial economy and income inequality grew rapidly. Compared to 2006, members of the quarter-million-dollar club saw their incomes rise by $100 million, or 26 per cent, but their contribution to the provincial coffers increased by only 2 per cent. 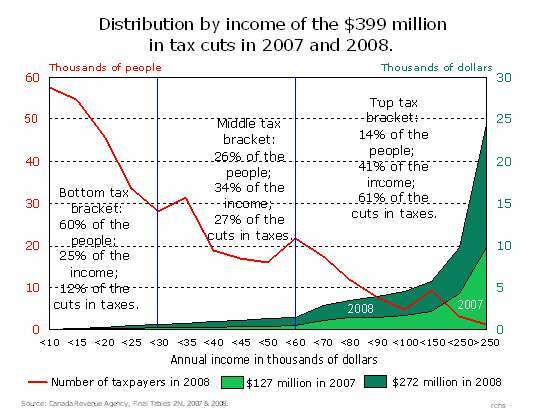 If the wealthy amongst us, those in the top income bracket, had continued to pay their taxes at the rates prevailing in 2006 there would not have been a deficit in 2009.